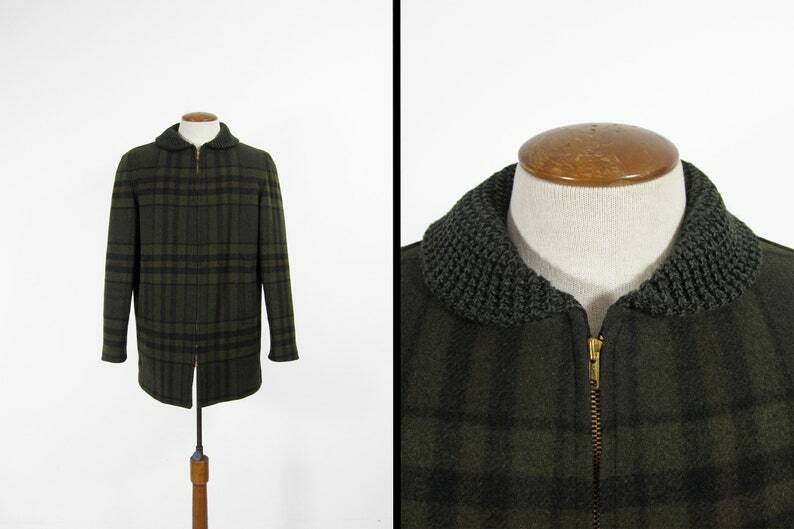 This dark moss green clicker coat dates back to the 1950s and is in excellent condition. Features include a chunky knit shawl collar, two side pockets, quilted lining, and large pattern plaid wool. It's long, with a slim fit and has some bulk making it suitable for cold weather. The only present wear is some smoothing at a few edges. This coat fits roughly like a men's size 38 but please compare the measurements below to your favorite coat, laid flat, before purchasing. Use a thick winter coat for best accuracy. Worked out great! Came in very fast!